1. It is compulsory to fill in particular about your furkid(s) at goo.gl/forms/RiVNA05AaG prior to visiting us with your furkid. This information will help us maintain a safe and fun environment for all guests. We are concerned not only about your dog’s safety and health, but also that of our other guests and our family members. Please take a few moments to tell us about yourself and your best friend. Kindly note that one form entry is for one pet dog. Choose to another entry for your second pet you have more than one furkid. 2. To help us caregivers in providing services that meet your needs, we strongly recommend information transparency. With accurate information prior to checking in your furkid in our home, we will be able to provide the most suitable care for your furkids. Appreciate if our customers can work together with us in this matter. 3. PamperPup welcomes all breeds of dogs and cats as long as owners are able to provide proof of up-to-date vaccinations. All dogs that attend PamperPup must be at least 16 weeks old and remain current on Rabies, Parainfluenza, Distemper/Parvo and Bordetalla vaccines. PamperPup strongly recommends that any dog attending our facility is current on these vaccines and we reserve the right to deny admission to any dog if these vaccines are not current. Please be aware that the Bordetella vaccine takes several days to be effective, so we recommend that dogs receive their vaccines at least 7 days before attending PamperPup. Also note that some dogs can exhibit symptoms of Canine Cough or Bordetella from receiving the vaccine. It is your responsibility to bring your dog’s vaccination records from a licensed veterinarian at enrollment and each time your dog’s vaccines are renewed. Vaccines that are not administered by a veterinarian can not be accepted because we can not confirm the proper dosage, storage, and administration of those vaccines. Therefore, you will need to be responsible for ensuring that we receive current vaccine records for your dog. 4. Please be sure that your pets are current for flea, ticks and heartworm medications prior to arriving for a lodging reservation. Kindly note that dogs found with ticks/fleas and lice will be given a tick bath and at the owners expense at an automatic surcharge of RM100.00 per dog. Dogs who check in to PamperPup in a dirty condition will also be given a shower, prices are: RM35 for small dogs, RM45 for medium sized dogs, RM60 for large dogs. Your furkid will interact with other furkids at PamperPup, this is to ensure all furkids at PamperPup are all clean and optimum in wellbeing. 5. Please bring along adequate amount of dog FOOD during check-in. This is to prevent sudden changes to your pet's diet which may cause tummy upsets. 6. Dogs entering the play area for group play must pass a temperament test before entrance (Kindly call us at 011 3311 8945 to make an appointment). This is to ensure that all dogs are friendly and do not have aggressive behavior or tendencies to maintain the integrity of the play area. 7. We prefer that bookings are made in advance prior to check in date to allow us to determine the availability for your furkids' furcation here at PamperPup. Spots are limited at PamperPup, as we believe in personal care towards your furkid, and to avoid our home from being overcrowded. This is especially important during festive seasons ie Christmas, New Years, CNY, and other major festivities. 8. We appreciate that pet parents fill up the pet profile form at http://goo.gl/forms/RiVNA05AaG prior to a successful booking. This form entry allows us to better understand your furkid's behavior, needs, and health condition. 9. For day care services and boarding less than 5 days, full payment is required upon check-in. We prefer online transaction/cash deposit (bank detail will be advised accordingly upon confirmation of booking). Otherwise you can choose to pay cash upon confirmation during the visiting session or upon check-in. 10. 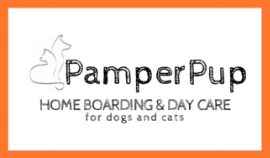 Here at PamperPup we believe in kennel-free and cage-free boarding. Furkids at PamperPup are grouped accordingly based on size and temperament. The benefits of this method over commercial boarding/day care include more exercise, increased freedom, a high level of socialization and a general fun and pleasant experience away from home. However, there are certain risks that come with all this freedom. The dogs are supervised at all times, however rough play does occur and this leads to a slightly increased risk of injury. While we strive to achieve a safe environment for all dogs at PamperPup, we cannot prevent accidents, injuries, illnesses or changes in behavior. By bringing your dog to PamperPup, you accept these risks and you release PamperPup and its staff from all liability arising from the occurrence of such events. Just as when you send a child to school, dogs can get colds, coughs, stomach bugs and other contagious diseases. Just as your child’s school does not pay for doctor’s visits when your child is injured or becomes sick, PamperPup does not pay for vet bills if your dog becomes sick or is injured while with us. If your dog is coughing, do not bring them to PamperPup until your vet has cleared them to be around other dogs (typically a week or so after their symptoms have subsided.) If a dog is boarding with us and begins to cough, we have isolated areas where they can stay that are vented to the outside until they are picked up. We will also notify you and contact a veterinarian on your behalf. PamperPup does require the Bordetella vaccine for all dogs that visit us. But, the vaccine, like a flu vaccine for people, does not prevent all strains of potential upper respiratory issues. Puppy Warts: These cauliflower shaped “warts” caused by the Canine Papilloma Virus typically appear in a dog’s mouth but can also appear on their paws or elsewhere. They most commonly appear in dogs with weaker immune systems like puppies. Like Chicken Pox for children, once a dog has had them, they have boosted their immune system against them and they typically do not get them again. So, it is often considered just a “right of passage” for puppies. They are not pretty, but they typically do not pose a health risk for your dog and they will usually just fall off in a week or two. However, if your dog does contract Puppy Warts, you may want to contact your veterinarian just to ensure that there are no health concerns you need to consider. Although Puppy Warts are contagious, very few dogs will contract them if they are around another dog with the warts since most dogs’ immune systems are strong enough to ward against them. Even so, PamperPup does not allow dogs that have Puppy Warts to participate in group play until the warts are gone. Accidents and Injuries: Just as a school or sports team can not prevent injuries for children who attend school or play sports, PamperPup can not prevent injuries and accidents 100%. While accidents and injuries can occur at any time, there is a greater risk of an accident or injury if a dog participates in group play. Dogs can sometimes receive puncture wounds or cuts, scratches, broken nails, sore paw pads, sprains or other injuries in group play. You need to be sure that you are comfortable with this prior to choosing group play for your dog. Also, it is important to check over your dog after they have participated in group play, grooming or otherwise attended PamperPup. While our staff checks over all dogs at least daily, punctures and cuts can sometimes be missed and can sometimes happen without our staff’s awareness. Even a small cut or puncture can become infected or cause more serious issues if not cleaned and properly cared for. So it is your responsibility to closely check your dog for any injuries and to ensure that they receive the proper care. If we are concerned that your dog has bloat, we will take them for emergency treatment immediately. We will contact you or your emergency contact if possible, but a decision may need to be made quickly. Surgeries relating to bloat can be expensive and may not be successful. If you would prefer for your dog not to have surgery in the event they are affected by bloat, you may document that in writing with a signature for your dog’s file. Otherwise, PamperPup will seek all available treatment possible in consultation with the veterinarian and you will be responsible for any expenses. Behavioral Issues: PamperPup is not responsible for any behavior issues or perceived behavioral issues that may result from your dog socializing with other dogs or otherwise attending PamperPup. Remember, if you are not comfortable with the increased risks associated with group play, you may always elect our Home Visit option for your dog. Allergies: If your dog has allergies of any type, it is your responsibility to ensure that the staff at PamperPup is aware of these allergies and the protocols to follow in the event of a reaction. If your dog has any food allergies, it is important to mention to the PamperPup staff and also provide the suitable medication during their stay at PPP. Health Conditions: All dogs attending PamperPup must be in overall good health and dogs in group play must be fit to play in an active environment. Dogs that have casts, stiches or medical devices are typically not good candidates for group play as the other dogs will be drawn to and chew on these items. Dogs that have hearing conditions can often be successful in group play, but dogs with vision impairments are generally not comfortable in a group of dogs. If your dog has hip or joint conditions, or other physical conditions, please discuss them with your veterinarian before your dog participates in group play or otherwise attends PamperPup. Please let us know if your dog has any health issues. We are able to care for many dogs with special health needs, such as special feeding, more frequent bathroom breaks, or mobility issues. There may be an additional fee required. So, if your dog needs special care, be sure to discuss this with us prior to your dog’s arrival so that we can determine if we will be able to provide the care your dog needs. 11. If your pet is not inclined to participate in group play, we will be on hand to walk and exercise them individually in our grass garden throughout the day. There's even a private and VIP room where your furkid can choose to have some privacy and alone time. 12. Furkid's pick-up and drop-off time will be advised accordingly upon confirmation of your booking. 13. We strictly do not entertain walk-in without a prior scheduled appointment. Kindly call 011 3311 8945 to get a visit slot arranged. 14. We appreciate punctuality for appointments (for visits, check-ins, check-outs) as we need to plan ahead among the team members of PamperPup and also to allow operations to run smoothly. Late Fee applies for last minute rescheduling and delays. 15. We have shorter operating hours during the weekends to allow us to rest before the hectic week starts. Our weekdays requires us to work long hours. Late/early check in/out and visits outside our operating hour can be arranged, however kindly note that late fee is chargeable. 16. Kindly note that holiday surcharge is applicable on Major and Public Holidays. The PamperPup Team appreciates your understanding that we operate during the important festive seasons. 17. While we don’t mind taking care of your elderly dog while you are away, you acknowledge that geriatric dogs do get sick and have the potential to pass on to the other side at any time. Because of their elderly nature you acknowledge the risk involved and do not hold PamperPup responsible for any possible illness or death due to their age. In fact, we aim to ensure that your elderly dog enjoy their stay at PPP by providing a quiet and comfortable space. We also assist your elderly furkid to the off leash park to have some supervised and leisurely walks, usually with calmer furkids who are gentle in temperament. Video updates are also sent to owners to keep family members updated about their stay at PPP.